A skincare regime should always start with a cleanser. A good cleanser unblocks the pores and strips away daily dirt and grime otherwise impurities will cling to your skin and dead skin cells will build up and make your skin prone to breakouts, dry patches and dullness. So don't forget to clean your face with right face wash. In today's post, I'm going to share my recent experience with Mama Earth Charcoal Face Wash. Let me move on to the review. Usually, Charcoal products are best suited for oily skin, as I do have a dry to combination type skin so I thought Charcoal products were not for me. 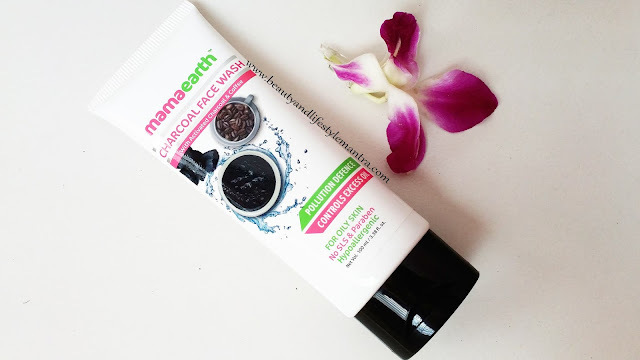 Before this product, I have tried Mama Earth's face mask C3 Face mask which has similar ingredients like this face wash and that mask is my most favorite face mask till date. After few uses of this product, it proves me wrong. I got this face wash from Mama earth, which is completely a new kind of face wash for me. I have seen this product many times on social media platforms, and I was really excited to give this one a try. It comes in a beautifully designed plastic tube with a flip open black cap. So as per the packaging, it’s quite easy to use and hygienic as well. It has a pack which is quite convenient and handy. The product is black in color as you can see in the swatch and has a nice consistency which is neither thick nor runny. I mostly use it at night. First, wash my face with and plain water then places the required quantity of face wash on my palm. Apply the face wash on T zone area, work up with fingertips and gently massage with small circular motion. I love the consistency of the face wash. Without any effort, it spreads easily on my skin. The texture of this face wash is really nice. I keep this face wash for one minute and rinse off with clean water. It removes all the excess oil and dirt from the T zone area. I do not use it all over the face because my skin is dry so I prefer to use it on T zone area and it works really well for my T zone area. Overall, I loved how it worked on my T zone area. It's not too harsh. 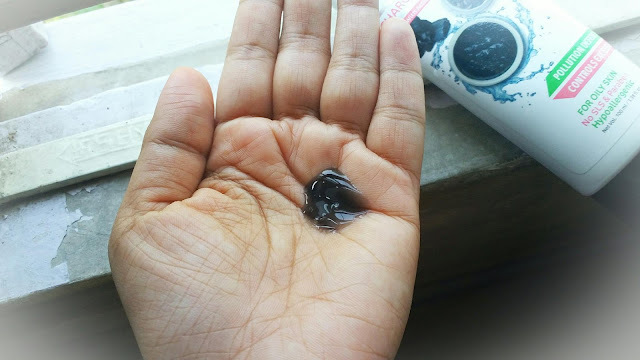 I'm sure those who have oily skin, they will definitely enjoy this Charcoal Face Wash.
Have you tried the Mama Earth Charcoal Face Wash? Please let me know in the comments below.